Utility, Indifference curves, and budget constraints, an example - FreeEconHelp.com, Learning Economics... Solved! Today we will go over the problem: When the price of X is 10 and the price of Y is 30, a consumer purchases 100 units of X and 50 Units of Y. Because 100 Units of X and 50 Units of Y are purchased, the consumer must be willing to substitute 2 units of X for 1 unit of Y to remain indifferent. 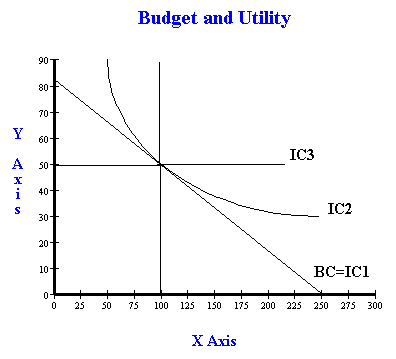 Given the prices, 3﻿ units of X can be substituted for each unit of Y along the budget constraint. Therefore, the consumer is not maximizing utility. Explain why you agree or disagree with this statement. The consumer purchases 100 units of X therefore she spends 1,000 on X. The consumer purchases 50 units of Y, therefore she spends 1,500 on Y. Up to 250 units of X can be purchased, and up to 83.33 units of Y can be purchased. Look at the graph below and check out the three different possible shapes of the utility functions. Note that BC = budget constraint, IC1 = Indifference curve for perfect substitutes, IC2 = “normal” indifference curve, and IC3 = indifference curve for perfect complements. The only indifference curve here that COULD make the above statement true is IC1 (indifference curve 1), the perfect substitute indifference curve. The reason for this is that with perfect substitutes, we either buy one good or the other (a corner solution), or can buy any combination of the goods because the budget line and the indifference curve overlap. Here I show this by making IC1 equal to the budget curve. However, the question says that the person is willing to trade 1 Y for 2 X which violates what we see with IC1. With IC1 the person is willing to trade 1 Y for 3 X so the above paragraph has contradicted itself. The next indifference curve is IC2, which is a normal indifference curve. We can see that IC2 is tangent to the budget constraint at Y = 50 and X = 100, which shows that this person IS maximizing their utility. The reason for this is because at this point the MUx/MUy = Px/Py, which means that the ratio of marginal utilities is equal to the ratio of prices. Since the price of Y is 3 times the price of X, we know that the marginal utility of Y is also three times the marginal utility of X WHEN X = 100 and Y =50. Remember that for normal indifference curves, as we consume more of a good, the less utility we get from it (diminishing marginal utility). This is why we have a curved indifference curve. This is also why the above paragraph is wrong. Finally we have IC3 which shows the indifference curve for perfect complements. Here, it might be possible that for every Y consumed, the consumer needs 2 X. Even though the price of Y is three times as high as X, the consumer needs 2 X to get utility from Y. Imagine that X is bread and Y is a pack of salami. In order to get a salami sandwich (this is what makes him happy), he must have 2 bread (X) and one Y (a pack of salami). So even if the prices are in a different ratio, he is not willing to substitute them based on prices. Ultimately, you always have to degree with this statement. Remember that prices don’t dictate what someone is willing to trade something for (although that would be easy). What ultimately matters is the combination of utility AND prices, which is why we try to equate marginal utility per dollar spent when we maximize utility. Also, remember the equation: MUx/MUy = Px/Py always occurs at the maximum and you should always get these types of questions right.